Louis Francis Huntly was born on 17th August 1881, the 1st of 12 children of Francis Huntly and Lizette Catherine Hermitage. He was christened at St. George's Roman Catholic Cathedral, Southwark, Surrey. 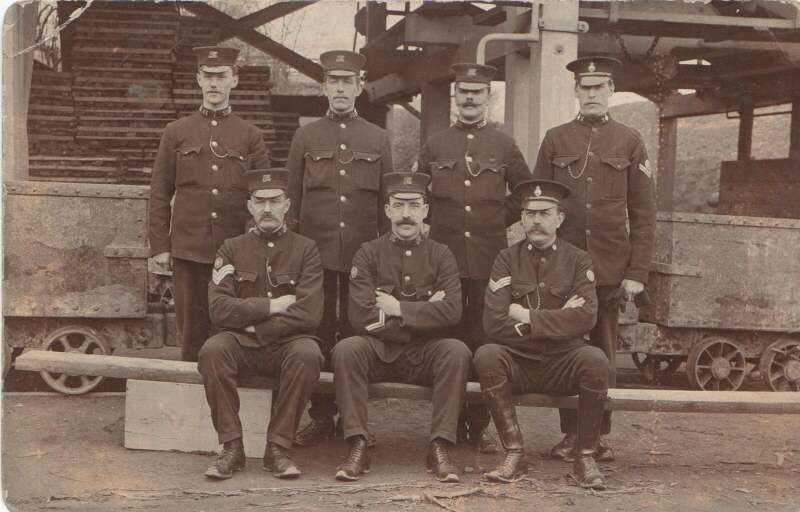 He served as a Private in the Second Boer War (1900-1902), then as a Police Constable in East Riding of Yorkshire Constabulary. At the start of WWI, he was a Sergeant in the Scotts Guards (see photo above) and, by 1916, was promoted to Second Lieutenant in the 1st Battalion Gordon Highlanders. 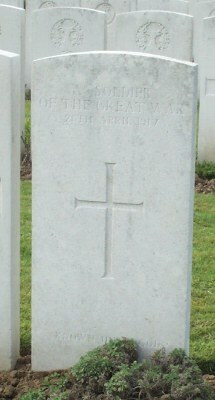 He was 'killed in action' on Thursday 26th April 1917 at Arras, France, aged 36 years. He was blown to pieces in a British front supply trench, and no parts of his body were ever identified for a named burial. Whatever of such remains were recovered were usually placed in an empty sand-bag and buried, together with identified bodies, in mass 'shell-hole' graves, pending formal re-burial in a cemetery as soon as the front moved forwards or shelling ceased and it was deemed to be safe. 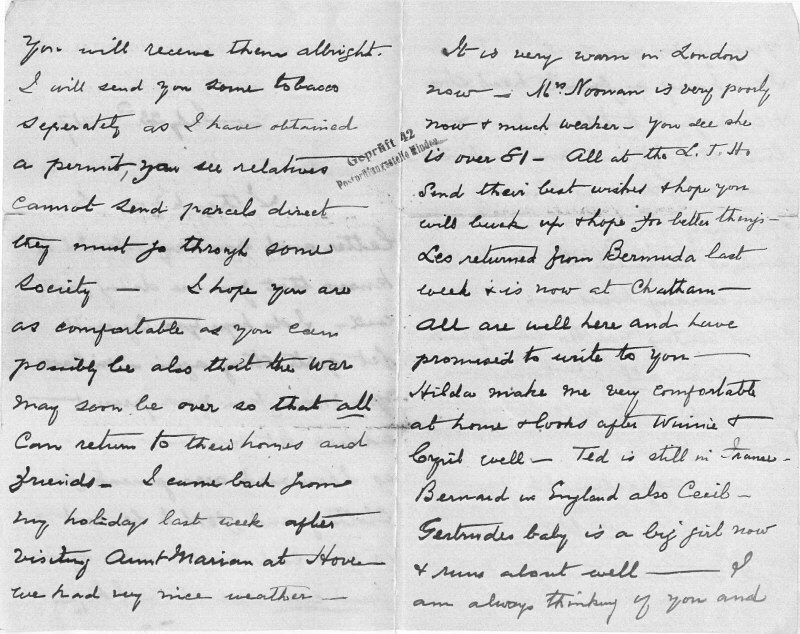 The Regimental Diaries show that he died with Captain A. Bothwell, MC, in the same explosion. Poor Louis must have taken the full force of the blast, as nothing identifiable remained of him, but Captain Bothwell was still identifiable; I suspect that their deaths were very quick and that they would not have suffered. 26th HQ moved to dugout of HQ RWF, KORL and KSLI: Heavy shelling, much sniping by night. 27th Further heavy shelling; hostile aeroplane brought down. Enemy attacked KORL and 'B' Coy, repulsed, 4 prisoners. 28th Front support lines shelled; Captain Bothwell and 2/Lt Huntly killed. Sniping worse! 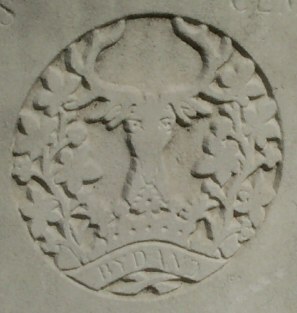 The Commonwealth War Graves Commission shows, "In Memory of Second Lieutenant Louis Francis Huntly 1st Bn., Gordon Highlanders who died on Thursday, 26th April 1917. Remembered with honour at the Arras Memorial, Pas de Calais, France. Panel Number: Bay 8 and 9. 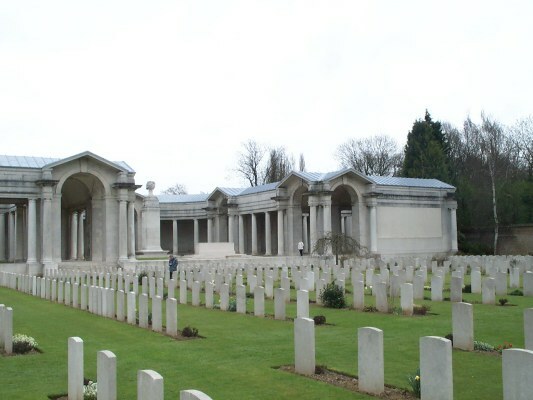 In the perpetual care of the Commonwealth War Graves Commission." 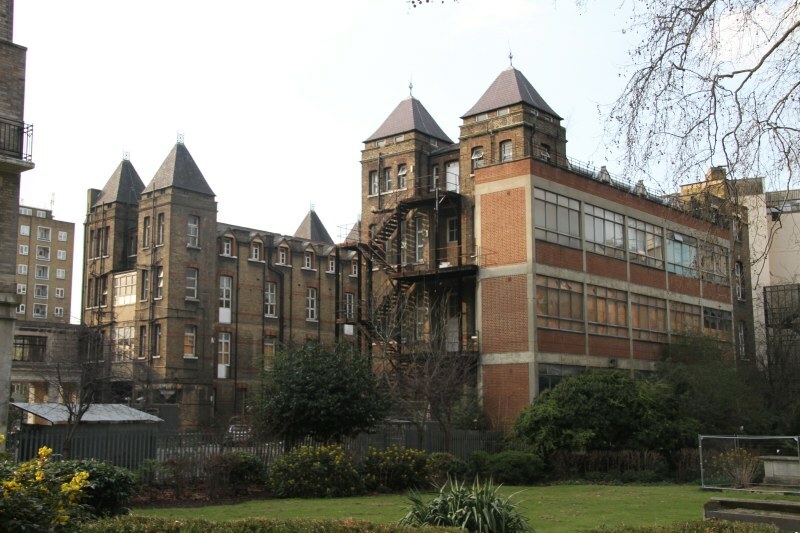 The London Temperance Hospital, 112, Hampstead Road, London NW, was built in 1879; in 1939 it became The National Temperance Hospital, but closed in 1990. Sadly, it is now empty, boarded up, derelict, with broken windows, and is awaiting a decision as to its ultimate fate. 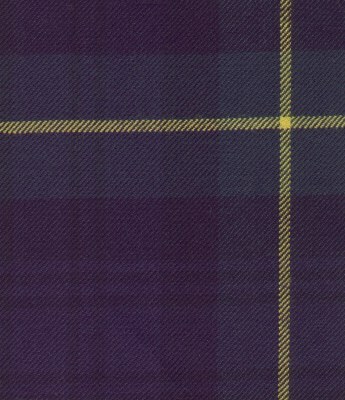 A piece of his Gordon tartan, with a kilt pin through it, was sent home to his widower father (since his remains were unidentified, just like thousands of other men, this presumably came from a box of such items to send home!). 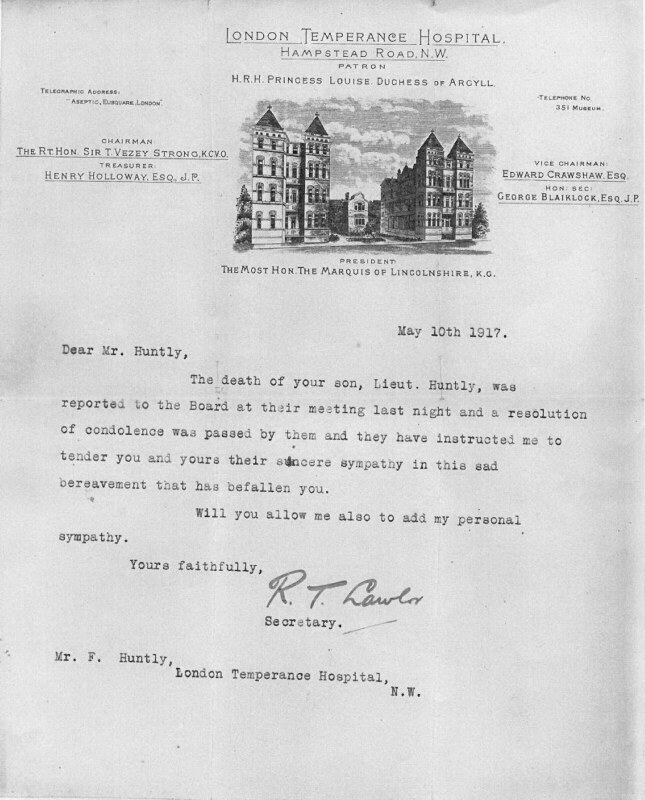 His father's employers sent him a letter of condolence (see above). The whole family mourned his sad loss, including his little sister (my Nan, the seventh child, born in 1892), who never forgot him and often told me about him when I was a young child. She died in 1974, but I never forgot. 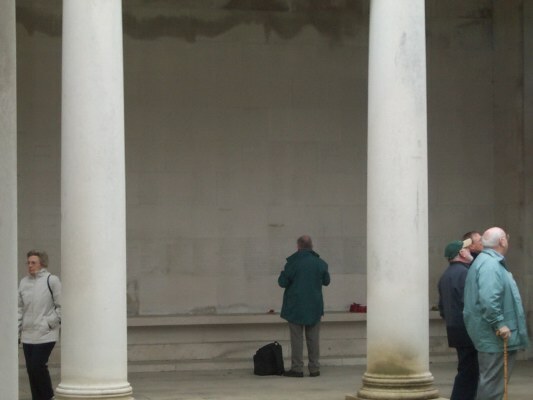 In April 2003, after a lot of personal research, I went 'on a mission' to Arras, France with Jonathan Nicholls, the author of 'Cheerful Sacrifice - The Battle of Arras 1917', Alex Bulloch, MBE (now deceased), and the team from The Birmingham War Research Society (then The War Research Society, now Battlefield Memorial Tours); see their current programme at Battlefield Memorial Tours. They are a very caring and expert tour group, with their owm beautifully illustrated coach, who make every attempt to get you to your relative's actual graveside or memorial stone. They even have a similarly-designed mini-bus to take individuals to graveyards that are a long way from the planned route for the bulk of the passengers, which took one man all that way down to 'The Somme' as a day-trip just for him. They have several extra people on-board to provide extra care for anyone who is upset or who has special requirements, as well as expert knowledge of battle sites. Some other tour groups mearly take you to the general area, and only visit those graveyards that are on their normal tour list. Part of the vast Arras memorial and 'Bay 8', one of the many panels. You can see how difficult it was to read the names from this photo, and there were many hundreds on each panel. Another day, together with Jonathan Nicholls, Alex Bulloch, and the team, we identified two blocks of eight graves at Feuchy Chapel Cemetery, near Arras, of men that had died on 26th April 1917 and whose bodies were brought in for formal burial in a proper cemetery, from that part of the field where Louis was killed. The ones at each end of the front block were marked as 'unidentified'. Captain Bothwell MC, who had died with Louis as a result of the same shell explosion in their trench, was buried towards the right end of the row behind; we all became convinced that the 'unidentified' burial at the right of the front row was Louis - emotion over-swept me and I wept openly for my dear old Nan, his little sister, who had hoped and dreamed all her life of such a discovery - it seemed that we had found him at last! 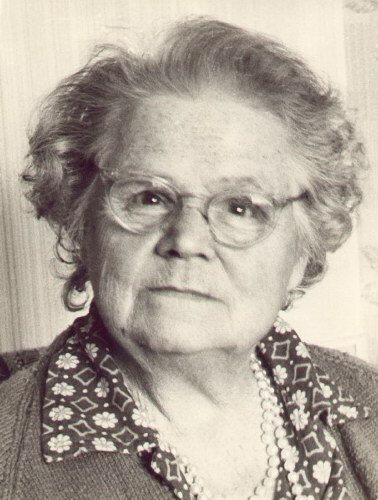 Louis' little sister, Gertrude Elizabeth Huntly (1892-1974), my dear old Nan. If only she had lived long enough for me to take her there - maybe she really was 'with me'. 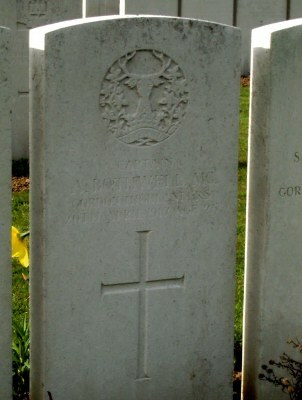 Captain Bothwell's headstone (centre), and those of the two un-named burials nearby, marked 'A soldier of the Great War 28th April 1917 - known unto God'. 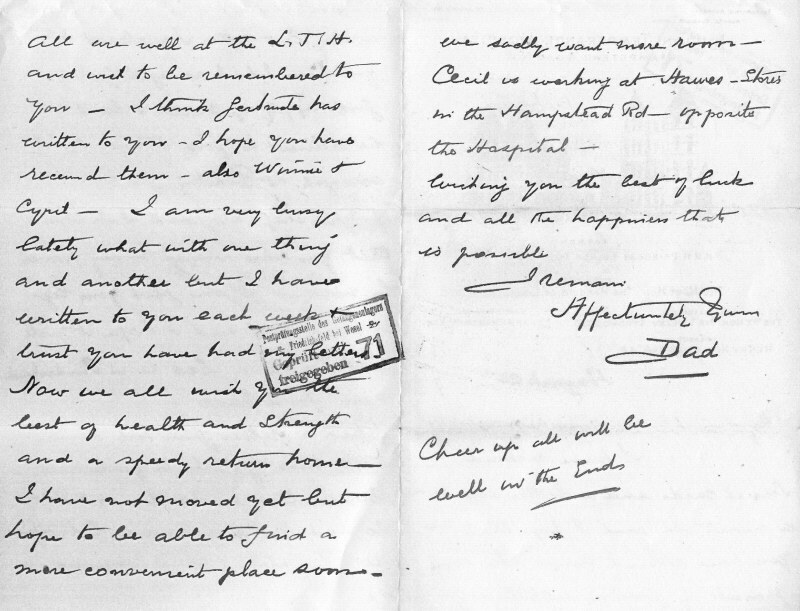 Captain Alexander Bothwell, MC, 1st Bn Gordon Highlanders was twice previously wounded. 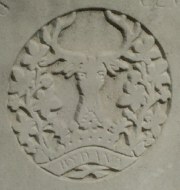 He earlier served with 1st Battalion London Regt (London Scottish). 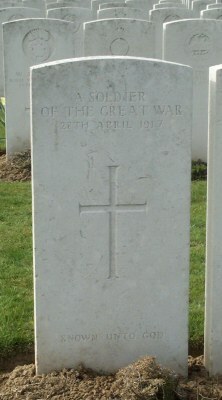 He died on 26th April 1917 aged 25. He was born at West Ham, London, the son of Alexander and Margaret Bothwell JP, and husband of Ruby Bothwell, of Aberdeen. Unidentifiable human remains such as those in un-named war graves were bodies, or just a few remaining body-parts, with no trace of their rank or regiment. Such body-parts were initially placed into sandbags and temporarily buried with other bodies in shell holes, awaiting burial in a nearby graveyard after the 'front' moved forward sufficiently or there was a cease-fire. 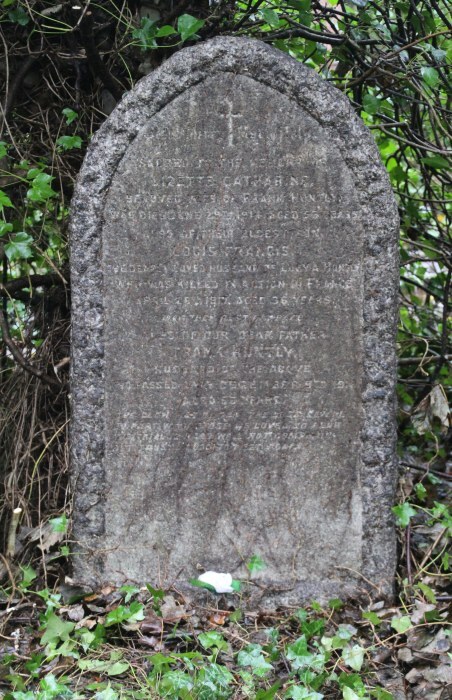 The area was just a vast expanse of mud and shell-holes, so these formal graveyards are now sometimes found in the middle of fields or hidden behind woods; many are far from the public roads and have special tracks leading to them. They are often respecfully visited by French families with their children, who are taught about the massive sacrifice made for them and their freedom. These French families quietly 'give-way' to visiting UK relatives and I have seen them bow towards these relatives as they quietly leave on their arrival; I was not previously aware of the great respect that is still felt towards those we lost in the fields of France in two World Wars. 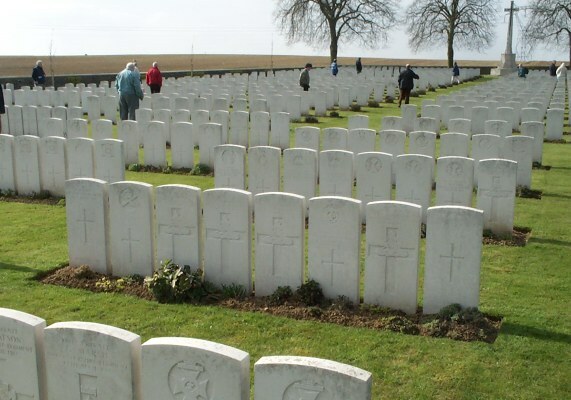 During World War I, British troops frequently buried dead Germans in proper graves and sometimes alongside their own dead in British cemeteries, unlike some other national armed forces who threw them in shell-holes as mass-graves along with dead horses and other debris of war. This act of consideration was re-paid during World War II, when British World War I graveyards, even those with Jewish soldiers' graves, were not interferred with nor damaged by the Germans; there was some 'respect' even then. While we were at one of the WWI cemeteries, we discovered that they had recent dug some shallow footings across a field for a new footpath. 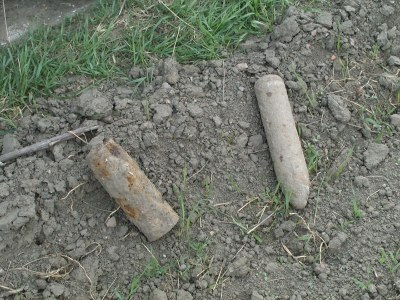 The workmen discovered the remains of two English soldiers from WWI in what had been a long-filled-in shell hole. Two new graves had been dug ready for their formal burial in the cemetery a few days after we were due to leave; otherwise, we would have attended the grave-side service. On the Sunday, we attended a small out-of-the-way cemetery that was seldom visited by anyone (they chose a different one for each trip) and Alex, in full Highland Dress played his bag-pipes, and we read out the names of those individuals that we had lost. It was moving ceremony for us all. I will be forever indebted to Jonathan Nicholls, Alex Bulloch, and the team for all the knowledge, time, care, fun, tears, and love that they shared with me on that trip - it was a truly memorable experience, and one that I will remember for the rest of my days. I was previously unaware that Louis had been married. From this brief mention of his wife on his parents' gravestone, I was able to research a great deal more information about them and their descendants. This is a good example of a 'small piece of the jigsaw' helping to add vast amounts of family information with very little effort. 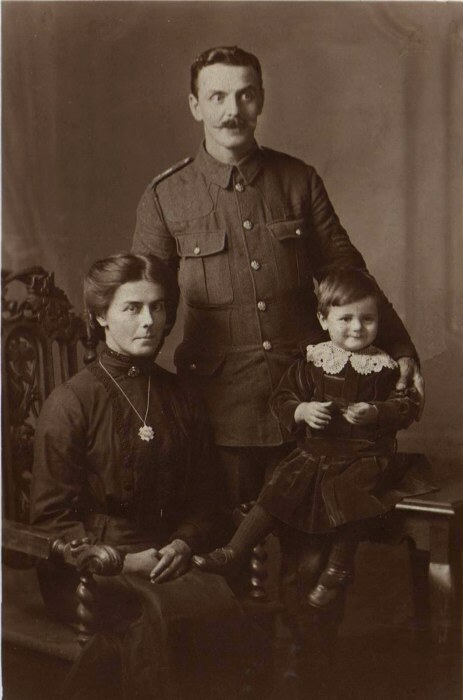 Louis Francis Huntly, his wife Lucy Amelia Henley, and their son Frank c1915. He was then a Sergeant in the Scotts Guards, and she was wearing a Scotts Guards Regimental Badge pendant. They later had a daughter, who was conceived when Louis was home 'on leave' due to being injured; she was only 5 months old, and Frank was just 4 years old, when their father sadly died. Such a young family to lose their dear Dad. Louis served in the British Army during 1901/1902 South Africa Campaign (2nd Boer War) as L. F. Huntly, Private 4321 in the 3rd (Prince of Wales) Dragoon Guards. He served at Cape Colony, Orange Free State and Transvaal. 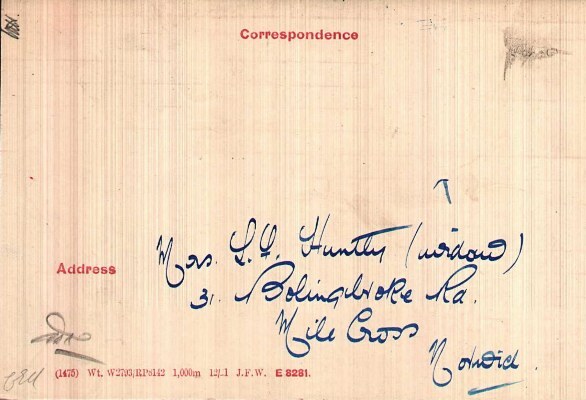 His Boer War Medal card shows, ‘First Name: L. F. Surname: Huntley [sic]. Rank: Private. Service: British Army. 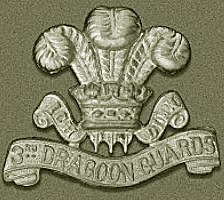 Regiment: Dragoon Guards. 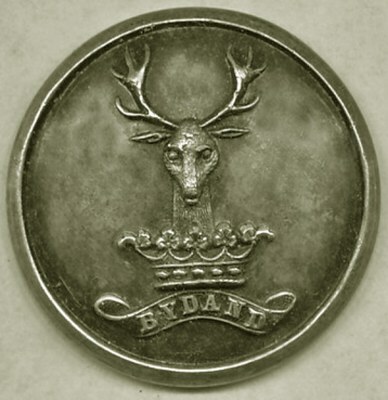 Battalion: 3rd (Prince of Wales). Service Number: 4321. Nationality: British. Campaign Medals: Queens South Africa Medal; Kings South Africa Medal. 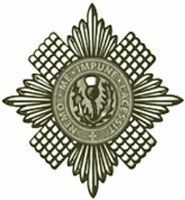 Clasps Awarded: Cape Colony; Orange Free State; South Africa 01; South Africa 02.’ The Regiment was deployed in the Boer War from 1901 to 1903, then to Ireland, England, and Egypt. By 4.11.1909, he had left the army and had become a policeman in the East Riding of Yorkshire Constabulary, based at or near Driffield, East Yorks., near where they lived. He rejoined the army about 1914/15, because of World War I, and received the 1914/15 Star. He was Sergeant No. 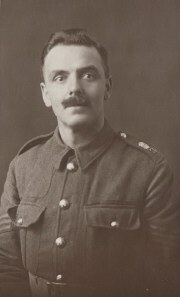 5314 in the Scots Guards; he may have been promoted on enlisting for World War I. At some time, between then and his death on 26.4.1917, he was promoted to 2nd Lieutenant in the Gordon Highlanders. In 1916, there was a recruitment drive to make up for the huge losses on junior leaders on the Western Front – the “lost generation of subalterns”, of which he became part; perhaps he was promoted then? 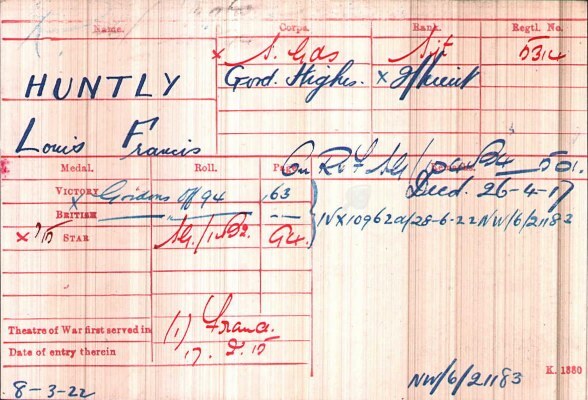 He served in France during the 1914/18 War; his Medal Card shows, ‘First Name: Louis Francis. 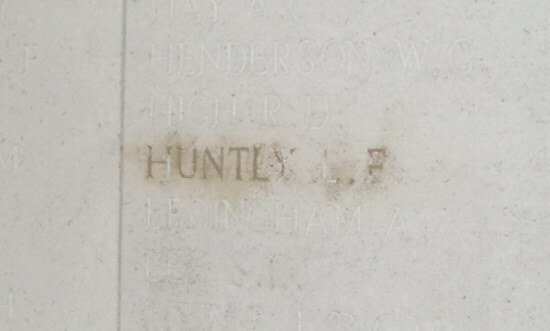 Surname: Huntly. Rank: Second Lieutenant. Service: British Army. 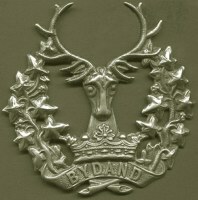 Regiment: Gordon Highlanders. Battalion: 1st Battalion. Nationality: British. 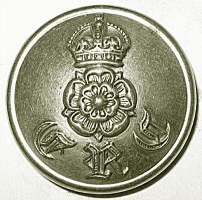 Campaign Medals: Victory Medal; British War Medal. 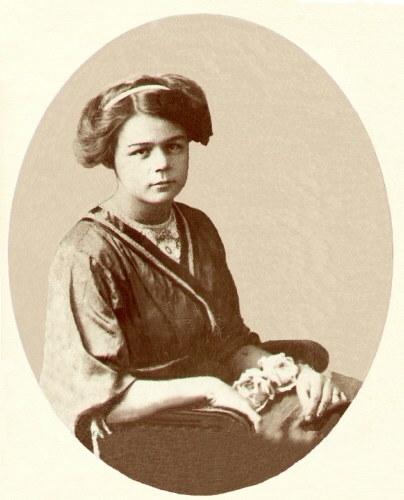 Date of Death: 26.4.1917. Commemorated: British.’ Hopefully, somewhere out there, are his medals; if you know where they are, please could I have a photograph of them? Louis Francis Huntly's World War I Medal Card; he had other medals from the Second Boer War. When Louis Francis Huntly died, he left a young widow, a four-year-old son, and a five-month-old daughter he had never seen, as did very many of his generation on both sides during World War I. The British achieved considerable success at Arras, showing how much generalship and soldiery had learned from the Somme in 1916. That complete success and strategic result eluded the British is one more testimony to the inherent nature of the stalemate of the Western Front through most of the First World War. 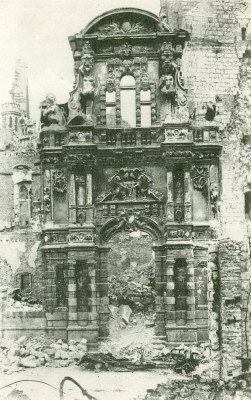 By the spring of 1917, Arras was the central town and main battleground of the British Armies on the Western Front and was the scene, throughout the war, of several battles fought by both the British and French Armies. The Battle of Arras was the most savage infantry battle of the war. Conscription had been introduced in May 1916. The Battle of the Somme lasted from 1st July to 18th November 1916, 141 days, approximately 415,000 casualties averaging at 2,943 a day. The Battle of Arras lasted from 9th April to 17th May 1917, 39 days, approximately 159,000 casualties averaging at 4,076 a day. The highest rate for any British offensive in the war. The Third Battle of Ypres lasted from 31st July to 12th November 1917, 105 days, approximately 244,000 casualties averaging at 2,323 a day. The Final Offensive lasted from 8th August to 11th November 1918, 96 days, approximately 350,000 casualties averaging at 3,645 a day. 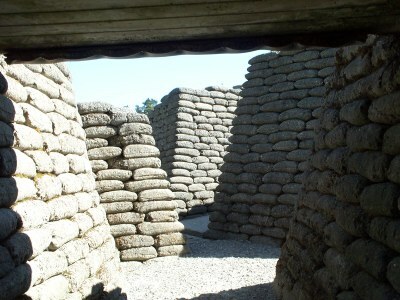 Behind their lines, the Germans erected a defensive barrier of concrete and steel bunkers, with interconnecting tunnels, it was known as the Siegfried Stellung (German name) or Hindenburg Line (British name); much of this was disguised as domestic buildings, by the addition of false windows and chimneys, or concealed behind earth banks. When the Germans retreated to this much shorter defensive position they freed many of their troops for other fronts, and operated a scorched earth policy between the original and new lines, leaving nothing for the advancing British and French armies. 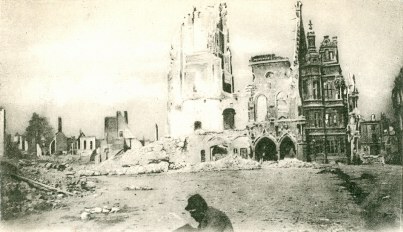 They destroyed all buildings and cut down trees, which were used to block the roads. Cellars were either destroyed or mined, as were the roads, and the wells were fouled; some half-demolished buildings, and anything that might be picked up by the British such as `souvenirs', were booby-trapped. The line ran from the river Scarpe in the north to the river Aisne in the south, with the British front along the northern half. The northern end of the line was at Arras, which was in British hands on 25th February 1917, but by 5th April 1917 the German front was at Neuville Vitasse. 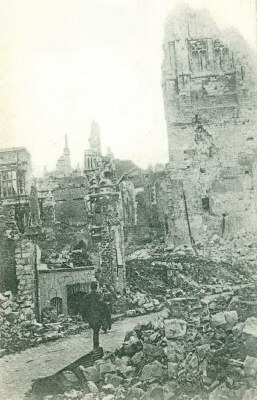 Arras was the most important French town held by the British Army throughout the war. 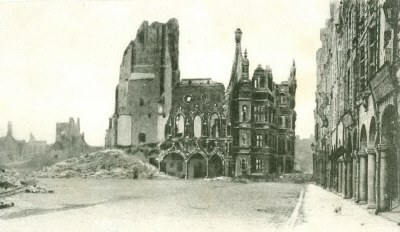 The British Third Army arrived on the Arras front in March 1916, relieving the troops of the French Tenth Army, who were sorely needed at Verdun. 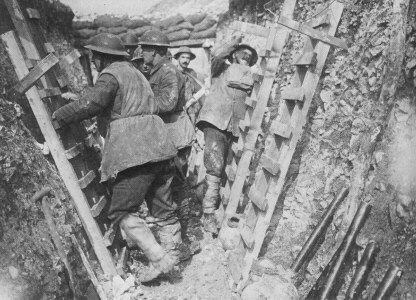 Tunnels were dug in the chalk hills to undermine the enemy's trenches by planting mines under them. 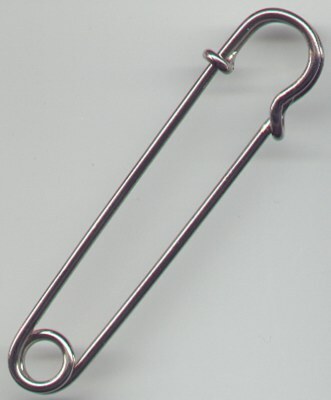 Civilian miners were employed for this purpose. Both sides made extensive use of the numerous caves in the chalk, which dated from the Middle Ages; these were under Arras and Vimy Ridge. German batteries lobbed shell after shell into Arras from a deep depression, north-west of Monchy-le-Preux, which was behind German lines. Another village in German hands, and even more of a natural fortress, was Roeux. 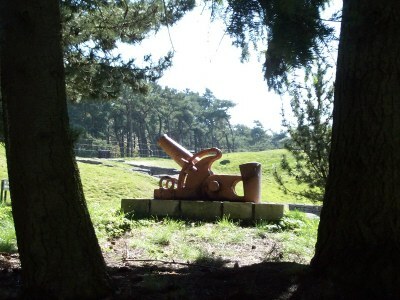 High on the wooded northern bank of the river Scarpe, standing over a stream of deep caves [in the chalk hills] Roeux was protected on its southern flank by the river and its lakes and marshes, while to the north the embankment of the Arras-Douai railway provided a man-made barrier. But the Germans were not content to rely on natural defences alone. Cleverly concealed amid the outbuildings of an old château, they had built one of the largest concrete mebus (blockhouses) yet seen on the Western Front. Moreover, near the railway station, a derelict dye factory had been fortified and connected to the château blockhouse by tunnels. This jumble of old vathouses, engine sheds and chimney stacks - the Chemical Works, as it was known, soon became all too familiar to British soldiers - overlooked and open plain to the west; evidently fearing attack from this direction the defenders further dug deep trenches in two small copses, Roeux Wood and Mount Pleasant Wood. 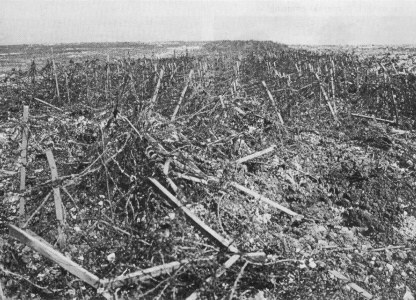 After the Germans withdrew, the Third Army's right flank faced an exceptionally strong section of the Hindenburg Line. It was finally decided that the infantry would attack on the 9th April 1917, on a front of almost ten miles, using ten infantry divisions with two in reserve - it was to be known as 'Z-Day'. 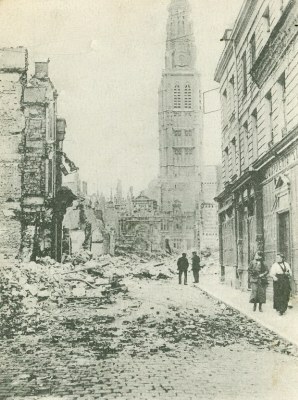 It was hoped that Monchy-le-Preux would be captured on the first day. Of the twelve infantry divisions involved, all had seen much action on the Somme. 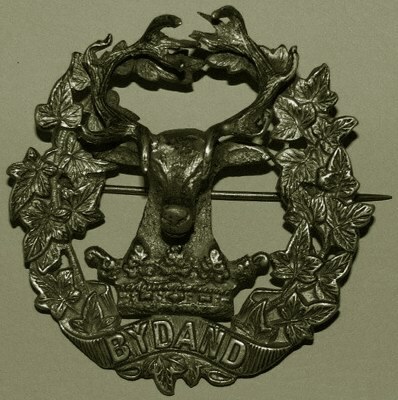 Three of the divisions were Scottish - the 51st (Highland) Territorial and the 9th and 15th Divisions - which, with a scattering of Scottish battalions throughout some of the other divisions, meant that over one third of the troops attacking on Z-Day would be Scottish. His younger brother, Francis Joseph Huntly, was born about 1885/6, the 5th of 12 children. He joined the army, in the Royal Berkshire Regiment, about 1903, and spent most of the 1st World War as a Prisoner of War (POW) in Germany. He joined the Post Office about 1932. He was a tiny frail man and had terrible ‘hollow’ cheeks, where he had been shot through the face and was ‘gassed’ during WWI in France. He entered the Royal Hospital Chelsea, as a ‘Chelsea Pensioner’ in 1951, and died about May 1955. His father Frank's letter of 23.7.1917, sent to Frank (junior) when a Prisoner of War in Germany; it is marked with two German POW handstamps: ‘Gepruft 42, Postprüfungsstelle Mindez’ & ‘Postprüfungsstelle des Gefangenenlagers, Friedrichsfeld bei Wesel, Geprütt und freigegeben 23’. 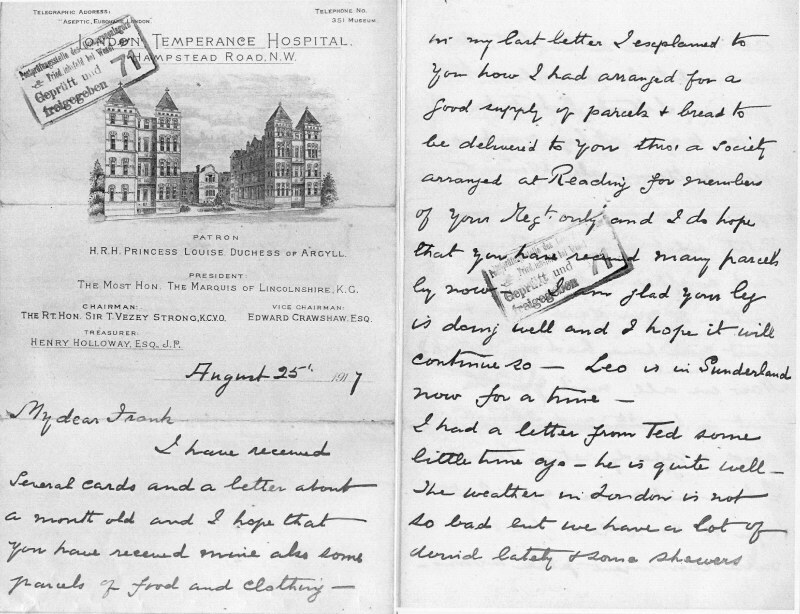 His father Frank's letter of 25.8.1917, sent to Frank (junior) when a Prisoner of War in Germany; it is marked with one German POW handstamp: ‘Postprüfungsstelle des Gefangenenlagers, Friedrichsfeld bei Wesel, Geprütt und freigegeben 71’. 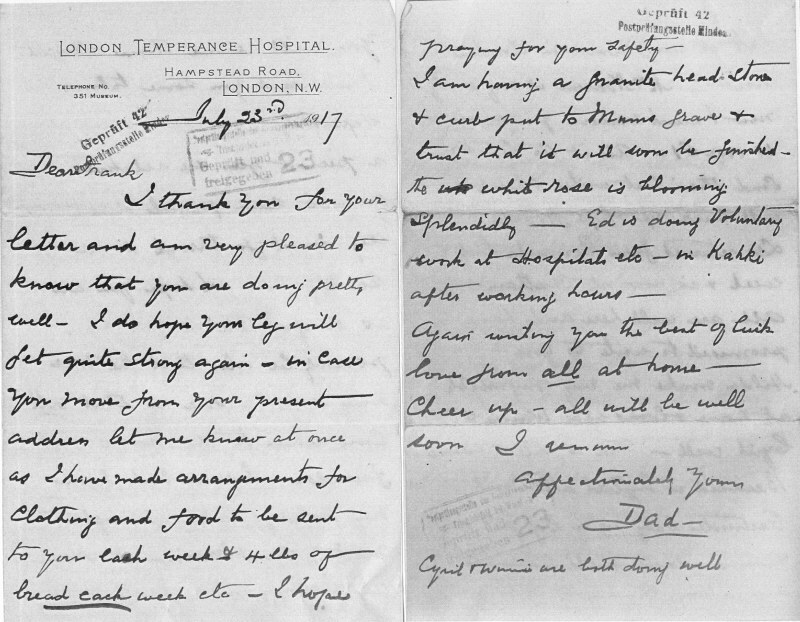 The two different letterheads are from The London Temperance Hospital (later The National Temperance Hospital) where his father Joseph Huntly worked as a hall porter; it is on the corner of Hampstead Road and Cardington Street, London NW1, and is currently in a very sad state, as it is empty and boarded up (see above). 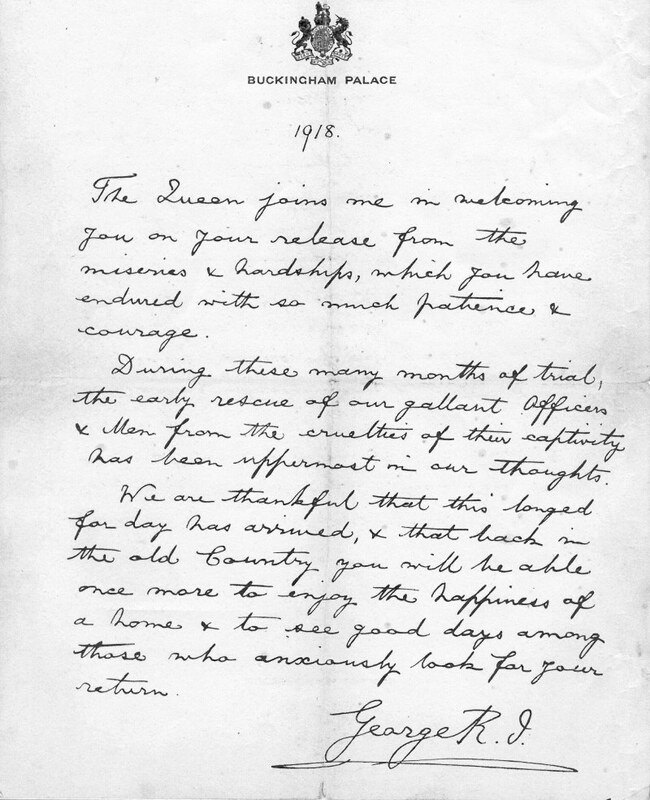 The letter Frank Huntly (junior) received from King George V, which was sent to former POWs to welcome them home after their repatriation at the end of the 1914-18 War. 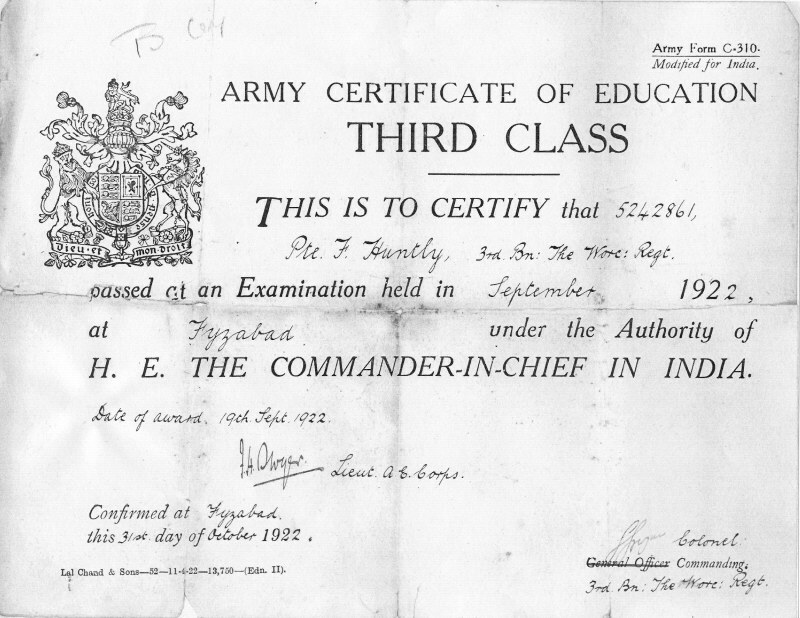 In 1922, he was still serving in the army as Private F. Huntly, B Company, 3rd Battalion The Worcestershire Regiment at Fyzabad, India, as this educational training certificate shows. Edward Hermitage (1837-1925) & his wife Ellen Mary O'Regan (1832/4-1913). Edward's father James Henry Hermitage (c1803/10-1880) appears to have been born in Suffolk; his mother was Sarah Talbot (c1809/11-1866) of Ashburnham, Sussex. 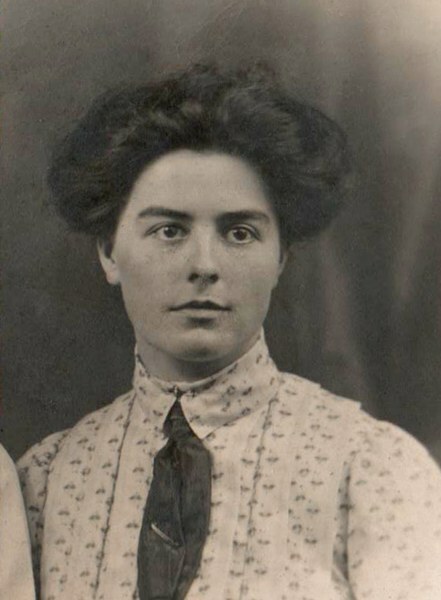 Ellen's father was William O'Regan, a cooper, of Adare, Limerick, Ireland and her mother's ancient ethnic maternal DNA was 'Arab'. I suspect that William served in the British Army or Navy during the Napoleonic War in the Iberian Peninsula (Spain & Portugal) and took a Spanish-Arab wife back to Ireland. There is a lot of Spanish-Arab DNA in Ireland as a result of this war in the Iberian Peninsula. All that now remains of Brad Street, Southwalk, where Edward Hermitage was a sawmaker at no.8 in 1860. The buildings were demolished about 1861 for the construction of the London Bridge to Charing Cross extension to the South Eastern Railway; the railway arches under Waterloo East Station now sit on where they once lived and worked. 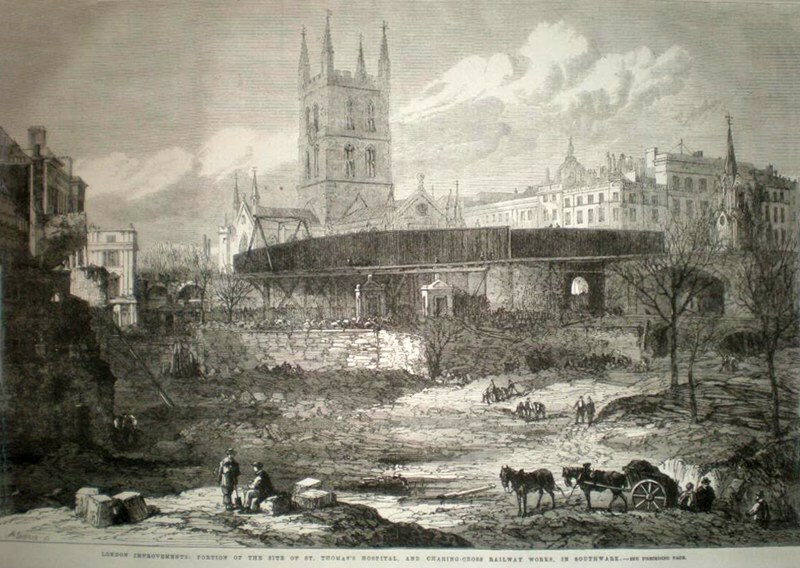 This 1863 Illustrated Lodon News engraving of the groundwork at the London Bridge end of the new railway extension to Charing Cross shows how excavation was undertaken using manual labour with spades and soil removal by horse and cart. How this must have disrupted local life and how much we have changed our construction methods in such a short space of time! 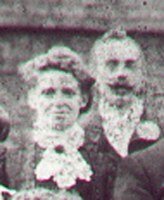 Their daughter Lizette Catherine Hermitage (1860-1914) and her husband Frank Huntly (1859-1918), who were the parents of Louis Francis Huntly (1881-1917). I suspect that Frank Huntly's family were Anglo-Indian, as they appear to be the source of my Indian DNA. 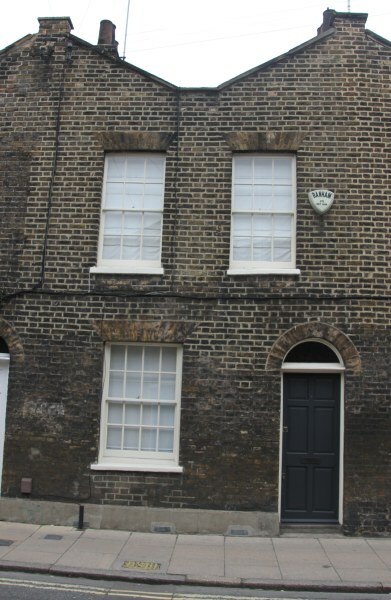 The photo above is: 53, Roupell Street, Lambeth, where Lizette Catherine Hermitage's widowed grandfather James Henry Hermitage was a boarder in 1871; he was formerly, a servant, a cook, and a confectioner. These cute little terraced houses were build in the 1820s by John Palmer Roupell, a gold refiner, as artisan workers' homes. They currently (2012) sell in excess of £650,000, as they are very close to the City of London where accomodation is limited. 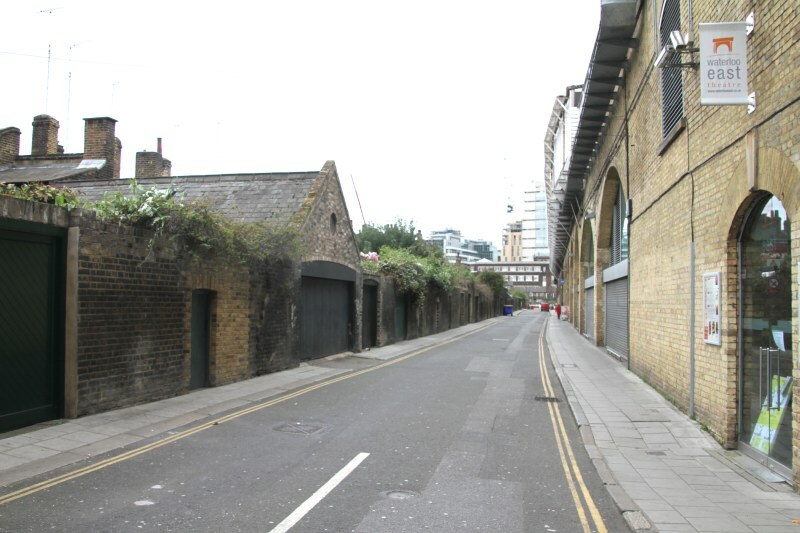 This is now the London Borough of Lambeth's 'Roupell Street Conservation Area' (this link is a .pdf file, which takes a while to upload), and most of the buildings are Grade II Listed. 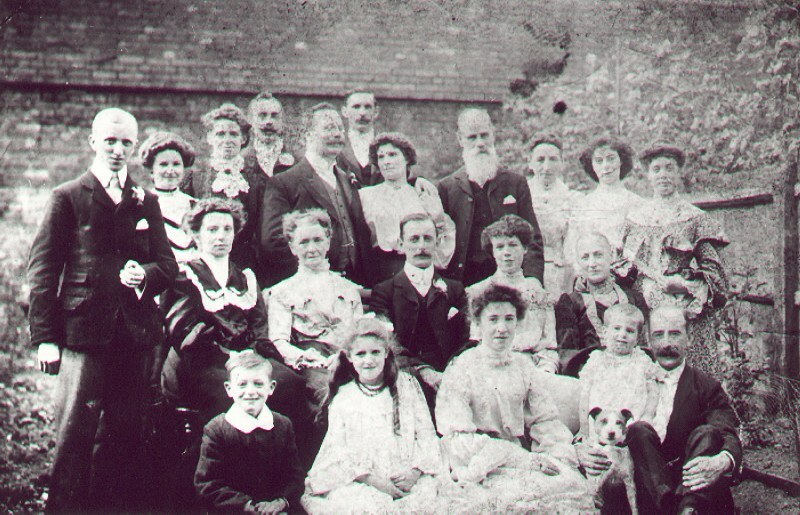 During the 19th century, the Huntly and Hermitage family owned a saw-maker's business and a cafe in Lambeth Walk, and also lived in Union Street, Paradise Street, Berkeley Street, King Street, New Cut, St. George's Roman Catholic Boys' School, and other nearby locations in Lambeth & Southwark; also in Acre Lane, Brixton, London. Many of the roads they lived in, especially in Lambeth Borough, have long-since been demolished and re-developed. There are some interesting views and maps of old London at londonpastandpresent. This family also lived in the Marylebone, Hampstead, and Camden areas. but without Louis, who was probably away from home in the army. 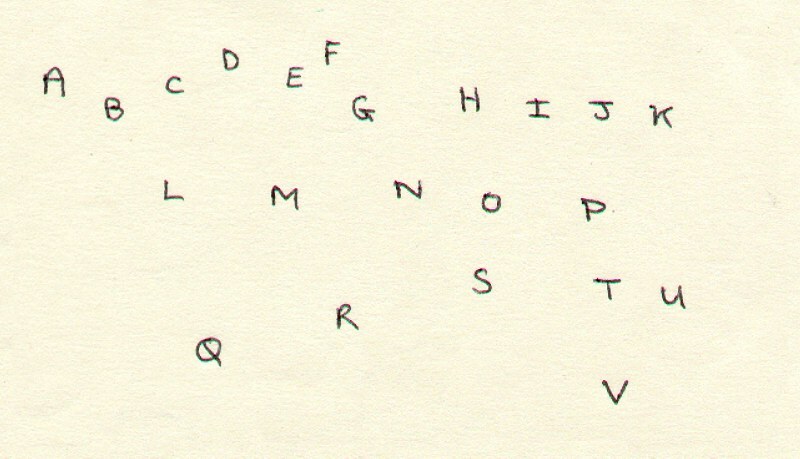 The 'name key' for the photo above: A: Jim Hermitage (Lizette's brother); B: Jim's wife; C: Lizette Catherine Hermitage; D: Frank Huntly; E: Fred Huntly (Frank's brother); F: (unknown); G: Fred's wife; H: Edward Hermitage (Lizette's father); I: Eileen Clark, nee Hermitage (Lizette's sister); J & K: Eileen's daughters; L: Hatty Hermitage (Lizette's widowed sister-in-law); M: Ellen Mary O’Regan; N: William Hermitage (Lizette's brother); O: William's wife (their wedding photo); P: (unknown); Q: Jack Hermitage (Edward Hermitage's adopted son, possibly the son of his daughter Annie, who later married Mr. Cohen); R: Nell Hermitage (daughter of Lizette's brother Edward); S: Lena Hermitage (Edward's wife); T: (unknown) Hermitage (son of Lizette's brother Edward); U: Edward Hermitage (Lizette's brother); V) his dog.